I was 87,000 words into the book before I discovered the bad news. I had no inkling. So it wasn’t as though this is a response to the disease or anything, the book had been kind of ready to go. And then 10,000 words from the end, as it turned out, I suddenly discovered that I had cancer. Quoted from this article on the BBC’s website. 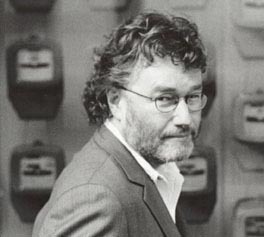 It was Iain Banks’ ambition to become a writer from an early age. However, he was 30 before he published his first novel in 1984. The début book was The Wasp Factory, a Gothic coming-of-age novel involving ritual cruelty to animals, puberty and uncertain sexuality, murder, insanity, but also tenderness and love in a number of forms. It had been turned down by no less than 6 publishers before being accepted by Macmillan. Macmillan published it, and immediately it attracted attention in the way it split literary critics into two camps. Some praised it as the first expression of a fresh new voice. Others condemned it as “a work of unparalleled depravity”. (That was the Irish Times.) The original paperback edition reprinted several pages of quotes from the reviews garnered by the first hardback edition. The hyperbole in some, especially in the unfavourable ones, was amusing. It was a clever sales gimmick. In fact, The Wasp Factory was a publishing success. Banks was able to do what probably every aspiring writer dreams of doing. He gave up his day job and took up writing full-time. I’ve been trying to remember when I first came across Iain Banks’ writings. It wasn’t immediately for sure. I was living in Finland in 1984 so the scandal and hype that surrounded The Wasp Factory completely passed me by. It may have been the publication of one of his rare short SF stories in Interzone (probably accompanied by an interview), which turned me on to him a few years later. I know I rapidly read every one of his books then in print, starting with Consider Phlebas (his first SF novel, written as by Iain M. Banks). After that, the latest Banks novel was a given purchase whenever I made my annual visit home to England. The Banks books I liked best, the ones I went back and re-read, were all among his earlier works: The Wasp Factory, Espedair Street, Consider Phlebas, The Bridge, The Player of Games, The Crow Road. (Though I admit I’ve not looked at the first four for some time.) But I guess I’ll be re-reading his entire back catalogue again in the near future. And I’ve placed an advanced order for The Quarry. The illustration is taken from the Notable Names Database page for Iain Banks where it is uncredited. Originally published on the separate At the Quill website. Copied to TheSupercargo main website 29 Dec 2016.